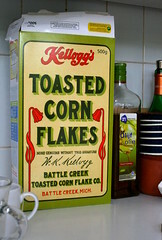 Corn Flakes: A bygone luxury of nationalism? Corn Flakes: A thing of the past? We’ve all heard ominous news of a global food crisis: rice riots, school lunch programs shutting down, hoarding and the like. We’ve also heard heated grumblings about the role of biofuels and speculators. What is making food prices rise, what are the consequences, and what can Canada do to respond? 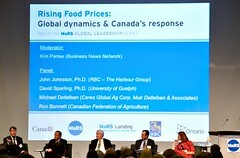 To get to the bottom of these questions, I attended the MaRS Global Leadership Series event, Rising Food Prices: Global Dynamics & Canada’s Response. Biofuels and speculation also have an influence, but the panelists deemphasized their importance. While 40% of the global corn harvest may be diverted into biofuels, Ron Bonnett, President of the Canadian Agriculture Federation, pointed out that this accounts for only 1% of the world’s arable land. Furthermore, the cost of raw materials is only one input into food product costs; according to Mr. Bonnett, there is only four cents of corn in a box of Corn Flakes. Likewise, John Johnston argued that while speculation may be at play, he suspects its role is not huge. Moreover, when seeking to address the issue, he argued that we should look at the fundamental causes.